This year’s Davos gathering is likely to be dominated by Donald Trump’s presence. I look forward to seeing him barge past other political and industry leaders to get his prime photo opportunity. As US equity markets continue to make all time highs in an unrelentingly fashion, it is scary to see the melt-up market been cheered on by the vivacious talking heads. 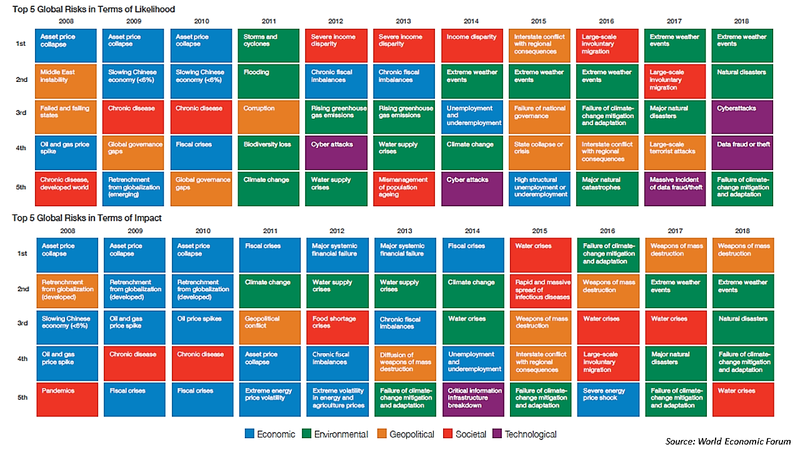 Ahead of Davos, the latest World Economic Forum report on global risks was released today. 59% of the contributors to the annual global risks survey point to an increase in risks in 2018, with environmental and cybersecurity risks continuing their trend of growing prominence, as can be seen below. Undoubtedly, environmental risks are the biggest generational challenge we face and it is hard to argue with the statement that “we have been pushing our planet to the brink and the damage is becoming increasingly clear“. That said, what is also striking about these assessments (and its important to remember that they are not predictions) is how the economic risks (light blue squares) have, in the opinion of the contributors, receded as top risks in recent years. The report does state that although the “headline economic indicators suggest the world is finally getting back on track after the global crisis that erupted 10 years ago” there is “continuing underlying concerns”. Amongst these concerns, the report highlights “potentially unsustainable asset prices, with the world now eight years into a bull run; elevated indebtedness, particularly in China; and continuing strains in the global financial system”. Risk management starts with identifying and estimating the probability and impact of a given threat. We can then decide whether a risk falls within our tolerance limits and how to react to reduce the risk or at least our exposure to it. Time and again, however, individuals and organizations stumble during this process—for example, failing to respond to obvious but neglected high-impact “grey rhino” risks while scrambling to identify “black swan” events that, by definition, are not predictable. One of the most pervasive cognitive blinders is the availability bias, which leads decision-makers to rely on examples and evidence that come immediately to mind. This draws people’s attention to emotionally salient events ahead of objectively more likely and impactful events. I do wonder about cognitive blinders and grey rhinos for the year ahead.